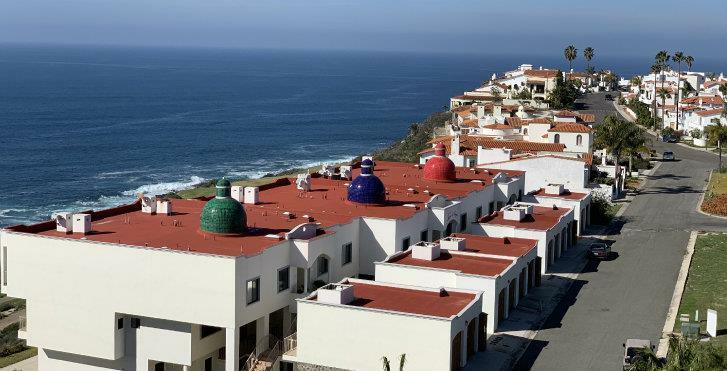 Santa Barbara at Bajamar is an upscale boutique condominium with privileged access to the miles of hiking, biking and walking trails throughout the 1,800-acre private ocean front reserve of Bajamar. This two bedroom, two bath condo has an open floor plan with a gourmet kitchen, dining area and living room all with views to the Pacific Ocean. The kitchen features granite counter tops, wine refrigerator, GE Profile kitchen appliances and plenty of cabinetry. The master bedroom features Jacuzzi tub with views to ocean, walk-in closet, double sink with granite counter top, travertine tile throughout. There is a spacious guest bedroom with built-in closet and views to the golf course. This condo is completely private with a large terrace which overlooks the new salt water pool & Jacuzzi with BBQ area and fire pit. The building is secure and has only 24 units in total. There is assigned underground parking for each owner and controlled access for privacy and security. This Santa Barbara condominium neighborhood within Bajamar, a Golf course gated community fondly called the “Pebble Beach of the South”. Surrounded by naturally green and rugged desert landscapes, dramatic vistas are made more spectacular by its secluded location along the coast, yet its proximity to the Ensenada wine region known as Valle Guadalupe as well as the world-renowned restaurants, entertainment options and shopping in both Rosarito and Ensenada, provide for a cosmopolitan lifestyle.